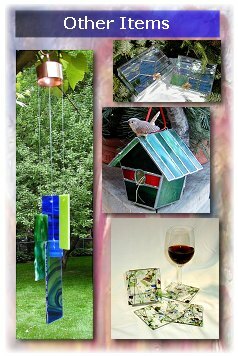 In addition to functional birdfeeders and houses, I also make "decorative" bird houses bevel boxes, stained glass coasters, Angel ornaments, and Suncatcher Windchimes. These are kind of fun little items that can fit in with a theme or in a garden room. These also make great gifts - for yourself or someone else. The decorative bird houses come in 3 styles: wren, chickadee and bluebird. Each comes with a resident bird and is filled with nesting material. Rubber feet are on the bottom to prevent scratching your furniture. Please indicate which style you want on the order form, and almost any color of glass is available. My "Suncatcher Chimes" make a delightful sound. Colorful pieces of ground glass are hung from a copper hoop with nylon line. They are strong enough to be used outside (I recommend a protected area). But they are beautiful enough to be enjoyed indoors. They make a great gift for yourself or a friend. These colorful wind chimes come in various lengths and colors. Stained glass coasters are not only practical but beautiful. These can be made from any kind of glass, but confetti glass, baroque, and various patterns of clear glass are the most popular. They are approximately 4" x 4", come in sets of 4, and wrapped in decorative wire. These make a great housewarming or hostess gift. My 5" high stained glass Angel ornaments can be used as a sun catcher in a window, to decorate a gift, or as a holiday ornament. They are usually made from confetti glass, but I also use iridized glass or unusual colors of glass, and are wrapped with lead-free wire and decorated with a glass jewel. The bevel boxes are great for storing jewelry, pins, paper clips, rubber bands, etc. If you have a teenage girl, she will absolutely love one of these. Just specify a color for the top, and if there is some special decorative accent you would like, one can be attached. These can include sun, moon, leaf, dragonfly, bird, flower, butterfly, angel, or cherub.